A Heart Foundation study has confirmed that an overwhelming majority of Australian children get to their primary and secondary schools in the back of a car. The study says this generation of young Australians are now among the most "chauffeured" and "cosseted" in the world. But "pick up" and "drop off" weren't always the words we used to describe the start and finish of the school day. Forty years ago more than 80 per cent of (primary, secondary and tertiary) students completed the journey on foot, by bike or on public transport. Yesterday's Heart Foundation study indicated 60 per cent were now driven; this is a remarkable level of behaviour change. And all this despite the fact that most kids still live within two kilometres of the school gate – they're not travelling any further, they're just not completing the journey under their own steam. Sadly, for many, the short car trip is now normal and humans are powerfully influenced by what they perceive as normal. Putting aside congestion and pollution issues, the consequence of an increasingly sedentary lifestyle on our children is profound. Visit any schoolyard and you'll see firsthand that overweight children are no longer rare. Children aren't moving as much, aren't burning up as many kilojoules, and many get nowhere near the minimum 60 minutes of activity health experts say they need each day for good health. So how do we get children riding to school again? As a community we are already building separated bike paths and bike sheds (though more can be done here), many schools run Bike Ed courses but assuredly the key to getting children back on their bikes and feet for the journey to school is the attitude of parents. It is parents who will ultimately make the decision about whether their child leaves home on a bike or on foot and no doubt the major factor in that decision is an assessment of risk. Parents deal everyday with risks and fears for and about their children and the worries swirling around in their heads no doubt include road safety, traffic volumes, abduction, injury and even how other parents might perceive them. The list of reasons not to ride can seem long: some families might think that riding is just too hard; both parents are working; they live in a neighbourhood seemingly designed to encourage car dependence; few if any other parents letting their children ride; and limited or no facilities to encourage riding. But easing kids out the front door and onto their bikes or feet for the journey to school is certainly worth considering for the simple reason that it's good for them – good for their bodies and good for their minds. There are thousands of parents who allow their children to ride or walk to school every day. Many parents started by completing the journey with their children, helping them to understand their neighbourhood, choose a quiet route and to evaluate the sometimes-complex challenges that even short journeys can have. Done properly and repeatedly these new skills will hold children in good stead for when they inevitably want to complete a journey alone. It is also good together time, riding and talking about the things you see. 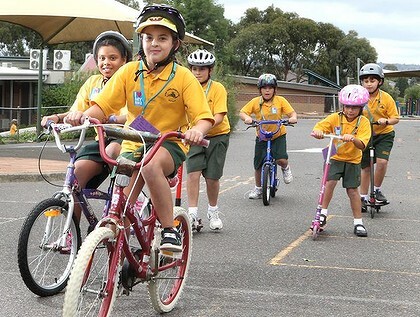 There are also thousands of schools who encourage riding by joining the Ride2School program, offering Bike Ed training, building bike sheds and all manner of events and encouragement. Local government are also (albeit slowly) getting on board and bike paths to the school gate and parking and speed restrictions around schools at key times are becoming more common. So, parents, give it a try. And if ever there was good day to do this it is tomorrow — National Ride2School Day, when tens of thousands of kids across the country will be riding or walking to school. Even if you only do it tomorrow, it's a great start. Scott Whiffin is the Ride2School program director, Bicycle Network.